Also known as the Creole State, Louisiana is located in the southern region of the country. Baton Rouge is the capital while New Orleans is the largest city in the state. Some of the prominent industries in Louisiana are agriculture, oil and natural gas and fishing. There are a number of colleges and universities in the state that offer learning programs for students with diverse academic and professional goals. Those who are interested in the field of nursing can also find a number of nursing schools in Louisiana that prepare students for the growing challenges of the healthcare industry. According to the U.S. Bureau for Labor Statistics (BLS), the healthcare industry will generate 3.2 million new jobs between 2008 and 2018, all across the country. According to the BLS, registered nurses (RNs), licensed practical nurses (LPNs), and nursing assistants (NAs) are some of the healthcare occupations that are likely to grow in the coming years (2008- 2018). A number of nursing schools in Louisiana offer degree and certificate programs, enabling students to acquire nursing skills and knowledge. Degree programs such as the associate and bachelor’s degrees are offered by many colleges and universities, all across the state. Master’s and PhD programs in nursing, on the other hand, are more specialized programs, helping students specialize in a particular nursing field. LPN programs are also offered at many Louisiana nursing schools along with accelerated nursing programs such as RN to BSN and RN to MSN degrees. Students who want to get into advanced degrees such as PhD must hold a bachelor’s or master’s degree in nursing. Besides, master’s degree candidates may also need to have a valid nursing license, and pass a drug screening and criminal background check. Advanced programs such as the master’s degree may also include courses such as pharmacology, nursing informatics, patient care management and nursing research. There were approximately 42,440 registered nurses in the state of Louisiana in 2010 according to the information provided by O*NET OnLine. The state will require approximately 52,020 RNs by 2020, which shows an increase of 23% jobs. 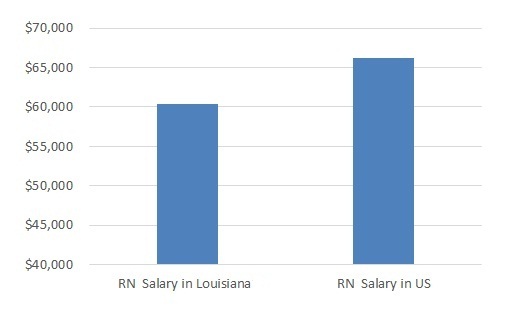 According to the BLS, the median annual pay for Louisiana RNs in 2013 was $61,780. With an increasing demand of registered nurses in Louisiana, now is the time to look into various nursing programs in the state. Registered nurses in Louisiana in 2013 earned a median annual salary of $60,400 or $29.03 per hour. RNs nationally earned a median annual income of $66,220 or $31.84 per hour, in 2013.